h, the waffle. Such a humble but delicious staple of any good breakfast, or dinner! Finding a good waffle isn't a hard task, but finding the best waffles can take some trial and error. We've done our research, and with some very full bellies, we can report back that these Tampa restaurants are serving up some of the meanest waffles in the area morning, noon, and night. Located across from Yuengling Brewery, RyRy’s takes chicken and waffles to a whole new level. Their menu is the only one in Tampa where you can get a buffalo waffle sandwich, which features deep-fried chicken rolled in buffalo sauce, covered in blue cheese, and sandwiched between two crisp waffle “buns” that are drizzled with donut glaze syrup. Are you drooling yet? This Seminole Heights favorite is an eclectic independent eatery, music, and venue serving up some delicious waffles! For their Soul Food Sunday, they serve a fried chicken and waffles entree leaving you completely satisfied. The Brunchery has been serving the Tampa Bay area since 1985, so with that much experience under their belt, you can be confident that you’ll be getting some of the Bay’s best waffles here! You can keep it simple with a traditional Belgian waffle topped with powdered sugar, or go big with their Waffle a la Brunchery, which comes topped with their special cream cheese sauce, fresh bananas and strawberries, and powdered sugar. Waffles for breakfast, lunch, and dinner? Sometimes you need to treat yourself, and this food vendor located in the Heights Public Market of Armature Works is the place to do it. Enjoy your waffles the way you like them, whether it’s plain, with a citrus glaze, or with fried chicken and a maple and bacon glaze. One thing’s for sure, though: you better come hungry! Datz is serving up some of Tampa’s most talked about waffles. Their breakfast menu features Chicken n’ Waffle Benedict with fried chicken, poached eggs, and tasso hollandaise sauce on a Belgian waffle. If that’s not hearty enough for you, then try their Waffles n’ Tweet with fried chicken, honeyed pecan butter, and a Belgian waffle with spicy smoked Buffalo Trace maple syrup and candied pecans. There may not be a more indulgent way to eat a waffle in Tampa! 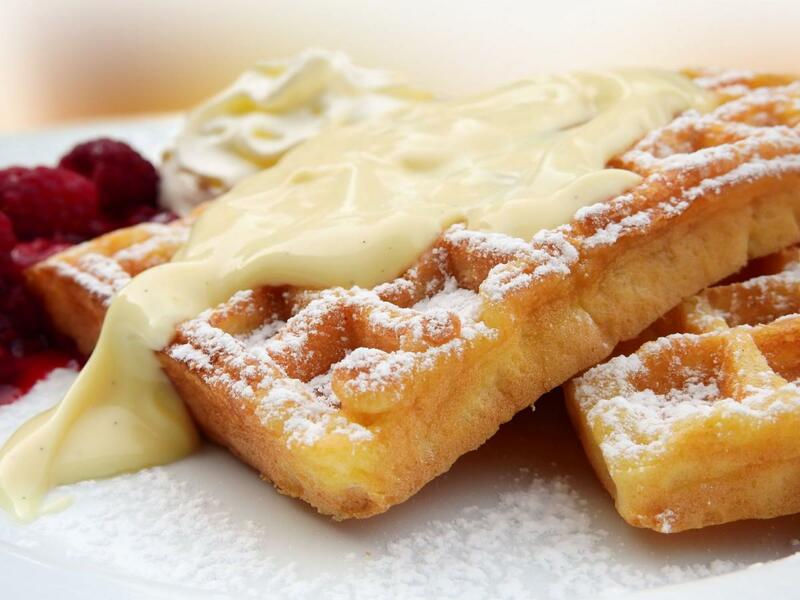 Serving up Liege waffles, homemade stroopwafels, waffle ice cream sandwiches, and savory croissant waffles, this spot in Wesley Chapel may be the ultimate waffle mecca! Their menu features concoctions like Samoa waffles and a Grilled Cheesy savory waffle. Stop settling for ordinary waffles and head to one of these places for the best waffles in Tampa! Find more great restaurants in Tampa by registering on 813area, your free local guide to the Tampa Bay area.